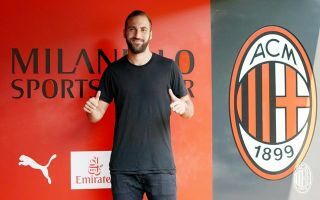 Gonzalo Higuain was officially unveiled as an AC Milan player on Friday, and he revealed the desire of the Rossoneri to sign him outweighed that of Chelsea. The 30-year-old will now begin a new challenge this season after sealing a move to the San Siro from Juventus, as he will now look to build on an impressive record of 146 goals in 251 games since moving to Italy in 2013. While his arrival could be crucial for Milan in their pursuit of Champions League qualification for next season, Chelsea boss Maurizio Sarri will now bemoan the missed opportunity to secure a reunion with his talisman during their stint together at Napoli. As per ESPN, both Chelsea and Milan were said to be in a battle to prise Higuain away from Turin, but the Argentine international has revealed that although Sarri wanted him at Chelsea, he felt as though the desire to sign him was greater from the Italian giants. Given Chelsea and Milan both struggled for goals last season in their respective domestic leagues, Sarri and Gennaro Gattuso will have been desperate to bolster their attacking options before the transfer deadline this month. However, it’s the Serie A outfit who have won the race on this occasion with Higuain now set to spearhead their attack with the hope that he can rediscover his best form and ensure that they break into the top four this coming season after back-to-back sixth-place finishes. As for Chelsea, Sarri has Alvaro Morata, Michy Batshuayi and Olivier Giroud at his disposal at Stamford Bridge, but time will tell if the Blues are able to provide him with a different option as they will now have to seek an alternative target.